Orange, White and Green Skittlette - Polish This! I have a really simple skittlette to share with you guys today! I used three coats of Take On Me on my middle and ring fingers. Then I did my index and thumb with three coats of OPI My Paprika Is Hotter Than Yours and my pinkies with two coats of Essie Ruffles & Feathers. Take On Me was really easy to apply, but as it is a jelly, it needed three coats for full coverage. I think it has quite good amount of glitters in it, not too much but not too little either! I quite liked this one, though then again, it's probably not the most unique one out there. This was actually quite a nice manicure for getting some of those untried polishes on nails, since I hadn't used any of these three before. I really liked Essie's Ruffles & Feathers too, it was sooo easy to apply (even with that thin brush) and I quite liked the color also, eventhough this type of green isn't always the easiest one for me. OPI My Paprika Is Hotter Than Yours looks really similar to Zoya Rocha, so I'll need to do a comparison of those two! The color is pretty nice, but the polish was quite sheer and it needed three coats for full coverage. By the way, I'll have something exciting here in my blog tomorrow, so be sure to check back then. ;) See you soon! Disclosure: I have gotten OPI My Paprika Is Hotter Than Yours from a goodie bag of our meet. For more information view my disclosure policy. hee hee, looks more like an Italian flag to me (that OPI looks very red-ish on my screen). Still, a lovely mani. I really like that essie polish. Well, you're right, it could be Italian flag... But I didn't plan to do that either... :D Thanks, it's nive to hear you liked it! 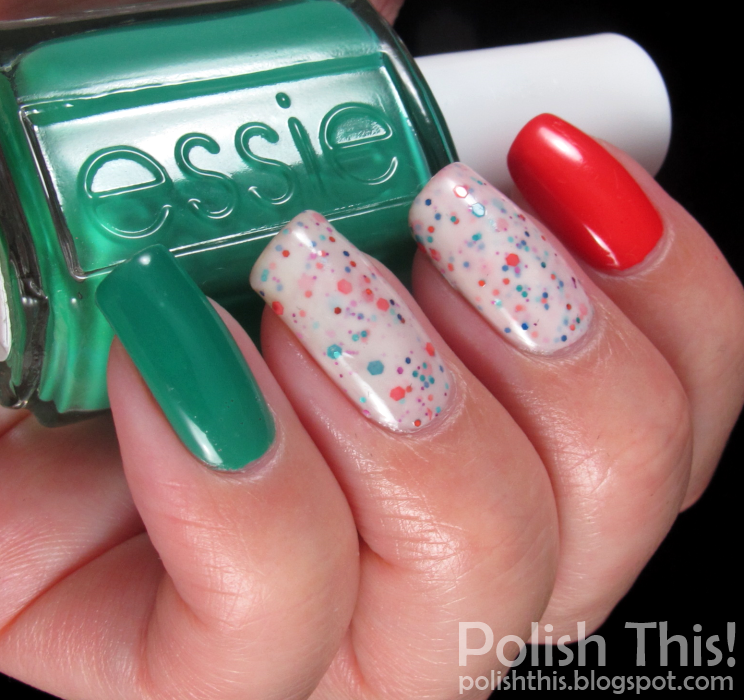 :) That Essie is a really great one.